NORWALK, CT – May 11, 2016 – Irving Levin Associates, Inc. will host an important webinar— Ins and Outs of Post-Acute Reimbursement (Bundled Payments)—on Thursday, May 19, 2016, at 1:00 PM ET. The webinar is part of the Interactive Webinar Series. The combined payment pressures from at-risk hospitals, ACOs, bundlers and managed care are leading to the emergence of ever narrowing post-acute networks. This momentum is further propelled by the CMS announcement of its goal to have 90 percent of Medicare Fee-for-service payments value-based by 2018. The combined market presence of bundlers and ACOs will be a tipping point for transformational change of skilled nursing facilities, home health and post-acute providers in many markets around the country. There will definitely be winners and losers as post-acute providers adapt to this new managed-care landscape, and single-site SNFs and HHAs will be particularly challenged. Andy Edeburn, MA, Vice President, GE Healthcare Camden Group, and moderator of the panel, will pose relevant discussion topics such as: What care redesigns providers must implement, how to successfully transform the provision of post-acute care and how to succeed under bundled-payment and other value-based payment models. Our panel of experts will address these topics and more—as well as answer any pressing questions the attendees wish to submit. Our experts include: Renee Cummings, Chief Executive Officer, Access Advantage, Access Elite, Access Innovations; Donna Mueller, Vice President of Network Development, Avamere Family of Companies; and Andrew Sheinen, Vice President, Strategy and Network Development, Kindred Healthcare. “Ins and Outs of Post-Acute Reimbursement (Bundled Payments)” is expected to generate an informative discussion. If you’re interested in this topic, then you won’t want to miss the webinar on Thursday, May 19, at 1:00 pm ET. 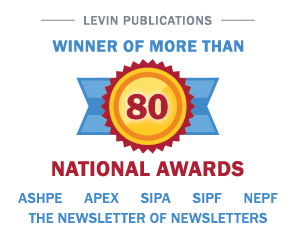 Please visit http://www.levinassociates.com/conferences/1605b-online-conference or call 203-846-6800 for more information about this interactive webinar.